The play "Ippon Gatana Dohyô Iri" was premiered in July 1931 at the Tôkyô Gekijô. The roles of Mohê, Otsuta and Tatsusaburô were played by Onoe Kikugorô VI, Nakamura Fukusuke V and Morita Kan'ya XIII. The play "Ippon Gatana Dohyô Iri" is made up of 2 acts and 5 scenes. The play is about Mohê, a failed sumô wrestler who is helped out by a woman called Otsuta, who is actually a prostitute although he is too naïve to realize this at the time. She gives him money and hair ornaments to pawn for food on his long journey to visit his mother's grave, and moved by her unexpected generosity, he promises to become a top-ranking sumô wrestler and then invite her to watch him perform the ring-entering ceremony. The scene shifts to ten years later, and the audience sees that Mohê has failed in his bid to be taken back into his former sumô stable, but instead has become quite a powerful, though kindly, gangster. He is looking for Otsuta in order to repay her with interest what she gave him. By chance he stumbles upon her shack where she lives with her small daughter. She has just been reunited with her husband whom she thought had died. Her husband is being pursued by gamblers whom he cheated by using loaded dice. When Mohê first arrives, Otsuta does not recognize him, but shortly, when he uses sumô thrusts on one of the revengeful gangsters, she realizes who he is. At last, he is able to help them escape and give them some money to take on their journey. 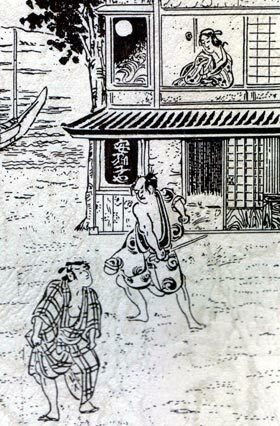 A modern illustration in the old style for "Ippon Gatana Dohyô Iri"